Bento doesn't have to be complicated or overly cutesy to be delicious and nice to look at. 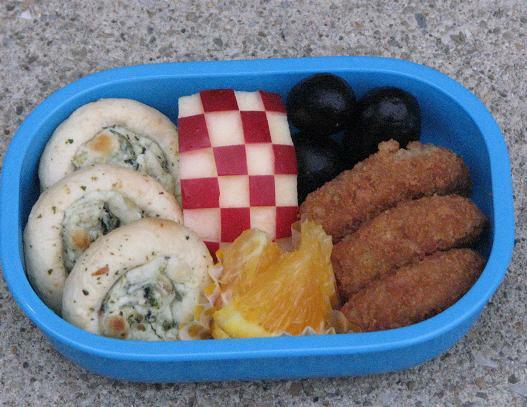 We had appetizers for dinner and there were some leftover, just perfect for bento! Kidlet has spinach and artichoke bread bowl bites with checkered apple, orange wedges, soy chik'n nuggets, and grapes. He was very excited about this bento today! Wow, what are those bread bowl bites? How do you make them? They look great! Kidlet must have been thrilled with them! Spinach and artichoke bread bowl bites? Love the idea! Might have to steal it! Sadly I didn't actually make the bread bowl bites. They are a Pillsbury appetizer called a Savoring lol. They were super delicious! I imagine you could easily create one tho! Your box does have very nice eye appeal today. I've always loved the checkered apple. It never gets old! Even when he was a carnivore the kid loved spinach and artichoke dip!